A gentleman riding out on his bay cob with his terrier. Francis Sartorius was exceptionally prolific and left a large corpus of signed, documented, and engraved work. Although based in London, where he maintained studios at various addresses in Soho, he was certainly itinerant, visiting race meetings (notably Newmarket) and gentlemen's seats and studs. He may have received some instruction from Thomas Butler, a print dealer and publisher in Pall Mall: a painting with Ackerman in the 1970's is signed and inscribed “Fs Sartorius pnx. At Mr Butler's in Pall Mall.”. 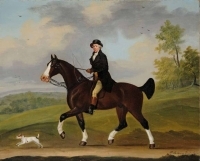 His equestrian and canine portraiture has a charming if wooden air which attracted considerable patronage among the sporting gentry and nobility, including such notable figures as the duke of Cumberland and Lord Rockingham. He exhibited frequently at the main London venues, the Society of Artists, the Free Society of Artists, and the Royal Academy. On 24 October 1757 he married Frances Lynn, who died before 1793 when he married, second, Grizel Dickson on 17 February. Francis Sartorius was among the first sporting artists to visit and paint in Ireland, where he worked for the second earl of Aldborough at Baltinglass, co. Wicklow (1787). He was also working on Irish commissions towards the end of his life. His sole published autograph letter is from Belmont, Cheshire, and is addressed to John Smith-Barry in Merrion Square, Dublin, and dated 11 August 1800. It confirms a commission for a painting of mares and foals on ‘a piece of canvas six foot long by two foot’ for which the price is to be ‘three guineas a horse’: the ‘foles’ Sartorius ‘give[s] in, which I don't think but will please’ (Repository of Arts, 1987). The accompanying sketch shows five mares, implying a price of 15 guineas for the painting—at a time when such painters as Sir William Beechey in London were charging 100 guineas for a human portrait of comparable size. Sartorius's productivity did not compensate for the low prices he charged: he died intestate, administration of his goods valued at just £100 being granted in June 1804 to his only surviving son from the first of his two marriages, John Nost Sartorius. The present painting is entirely typical of the charming and unassuming work he was producing throughout his life, and was painted when the artist was at the height of his success in his early 50's. The picture has long been in the Arkwright family (they of Industrial Revolution fame), but sadly the identity of the sitter has been lost. He does, however, bear a resemblance to Richard Arkwright Jnr. (1755-1843).